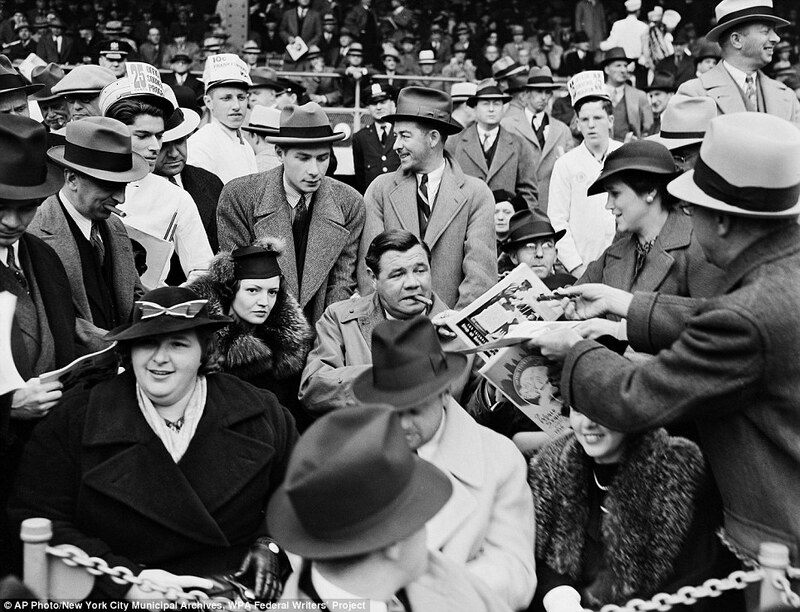 The Great Bambino: In this September 30, 1936, Works Progress Administration, Federal Writerís Project, photo provided by the New York City Municipal Archives, a man hands a program to baseball legend Babe Ruth, center, as he is joined by his second wife Clare, center left, and singer Kate Smith, front left, in the grandstand during Game One of the 1936 World Series at the Polo Grounds in New York. I really love this photo. I am a huge baseball fan, although have not been following lately. I love the vintage players, like Babe Ruth and Lou Gehrig, who set the tone for the players today. There is so much detail in this photo. I love all the hats, men and women wore them daily in that time period. My Dad always wore some type of hat, and he looked good in them too! What fun it would be to go back in time, wouldn't it ? I would be thrilled to meet "The Babe" ! !